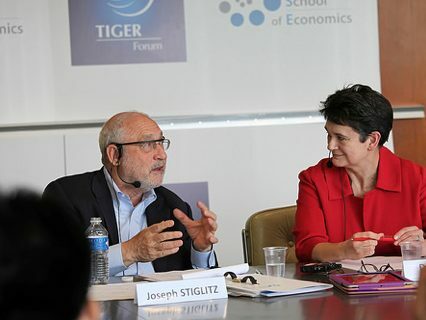 Earlier this month I wrote about Joe Stiglitz’s Jean-Jacques Laffont speech at the Tiger Forum, which was based on his new book with Bruce Greenwald, Creating A Learning Society: a new approach to growth, development and social progress. Stiglitz won his Nobel Prize for his massively important work on asymmetric and missing information – how this shapes institutional structures, including markets. His Nobel Lecture is well worth the read. This book builds on the information-based approach, and links it to other work on endogenous growth theory, which sees the process of growth as a cumulative process in which knowledge builds on earlier knowledge. This makes ideas (including those formalized as ‘intellectual property’) and people (to whom ideas are attached) the key to economic development. Stiglitz and Greenwald introduce industrial policy to endogenous growth models. They cover, among other areas, trade policy, intellectual property regimes, industrial strategy, and competition policy. It’s a somewhat technical book – there are quite a few equations and models at I would say advanced undergraduate level – although one could skip those bits and still follow the argument. I agree with the authors’ motivation for this book. They write: “Everyone today speaks of the innovation economy or the knowledge economy, and there have been important advances in the analysis of, say, patents and patent races, and network externalities, to take but two examples. But the full implications …. for the neoclassical model have still not been taken on board. And the implications for policy have been even less absorbed into mainstream thinking.” They go on to point out that it is 40 years since Stiglitz’s work on information questioned fundamentally standard economics results such as the existence of equilibrium, or the uniqueness of equlibrium, but little has changed in the standard approach. I doubt that any ‘mainstream’ economist would challenge the importance of the results on asymmetric information, non-linearities in growth and so on, so it is a puzzle that so few have taken the implications seriously. No doubt the answer lies in the sociology of the profession and academic incentive structures. My sense is that this is now changing. While not agreeing with every specific policy prescription they make, information, knowledge, learning – whatever you want to call it – definitely does change the prism for assessing structural economic policies. Maybe Prof Stiglitz will next write the popular book that makes this shift in perspective accessible to the policy world. This entry was posted in Main Page and tagged development, information, institutions by Diane Coyle. Bookmark the permalink.